I was given a copy of Our Family's Jesse Tree to review, but all opinions are my own. This post does NOT contain affiliate links. Please see our disclosure for more information. Advent will be starting at the end of the month! This year, Jim and I are planning to do a lot more to prepare ours and our kids' hearts, minds, and souls for the Birth of Christ. One thing we're really excited about is having our first Jesse Tree, and I've been given a great book to help us! 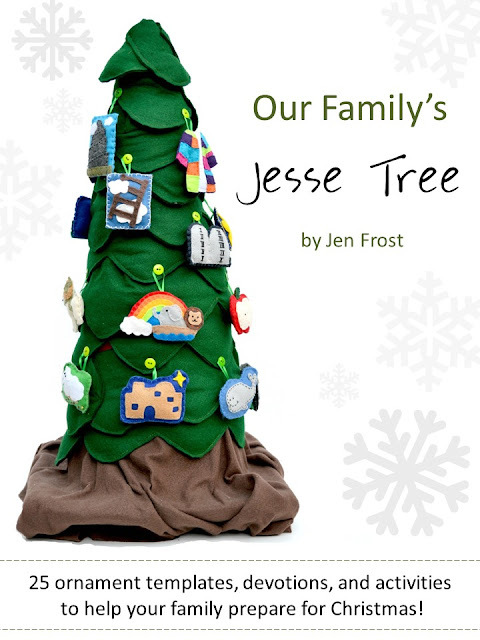 Over at Faith and Fabric, Jen has a new family craft book for Advent called Our Family's Jesse Tree. 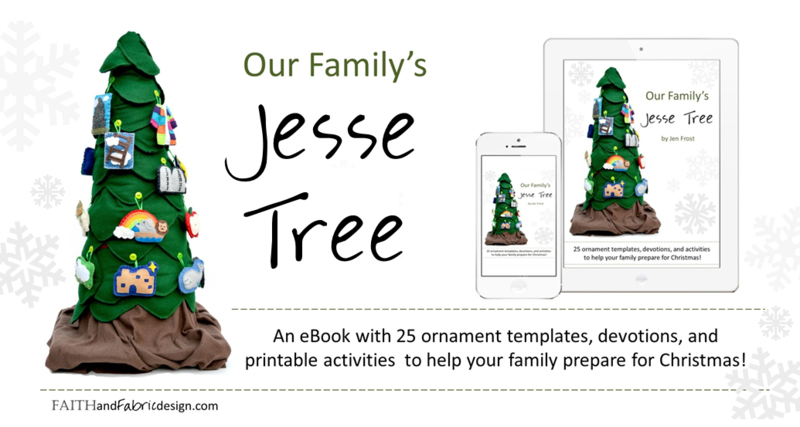 It's filled with activities and reflections on the Jesse Tree for every day leading up to Christmas. Each of the 25 days has an opening activity relating to that day's Bible story, how the story connects to Jesus, a call to prayer, and then a coordinating ornament. Each day starts out with an activity that is engaging and fun for the kids (and parents!) and draws everyone's attention to the Bible story. The section about the connection between Jesus and the Bible story is easy to understand for the kids, but it still draws out rich meaning for the adults - even from stories we've heard many times before! The prayer section is open ended - it gives you a great start and then leaves each person in the family to add their own intention. It's perfect for teaching and guiding your children to form their own personal prayers. I also love how the ornament crafts are so versatile! Professional crafter? Well, then you can sew your ornaments according to the easy-to-follow instructions with templates. All you own are scissors and crayons? Then, you can print out the ornament and have your child color it. Somewhere in between? 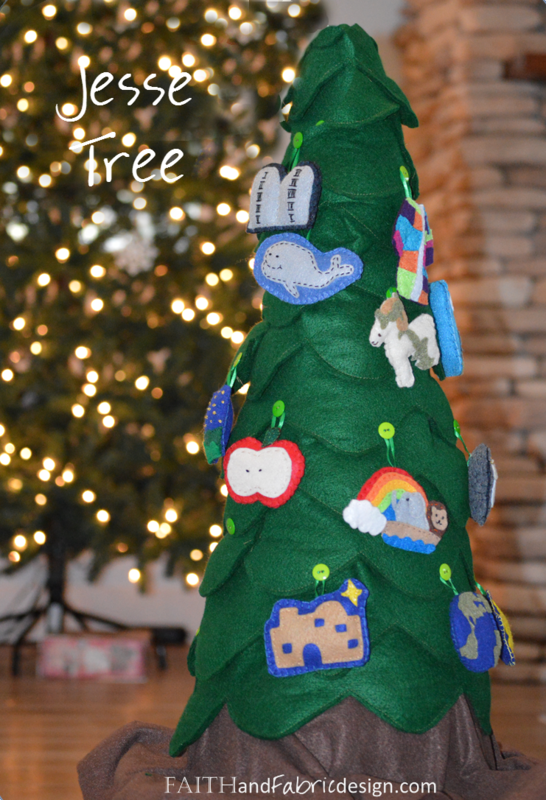 You can use felt and fabric glue or craft foam and glue to make your ornaments each day. I am really looking forward to growing closer to God as a family by using this book to help us prepare for the Nativity of our Lord for this and every Advent! 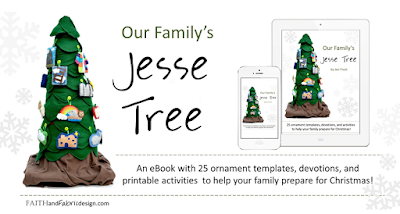 Would you like to win a copy of Our Family's Jesse Tree? Head on over to Faith and Fabric's Facebook page and Instagram! She's giving away a copy from each outlet from now until November 7th! Or you can go ahead and click here to purchase Our Family's Jesse Tree for the sale price of $5 from now til November 7th. Starting on November 8th, it will return to it's regular price of $7.50. Does your family have a Jesse Tree tradition? What does your family do during Advent to prepare for Christmas?